The satellite images on this page were recorded by the Moderate Resolution Imaging Spectroradiometer (MODIS) now orbiting aboard two of NASA’s satellites, Terra and Aqua. 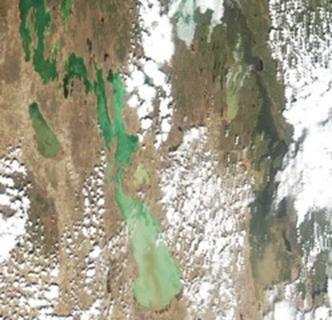 Unless otherwise noted, the actual colour renditions were prepared by the MODIS Rapid Response Team out of the University of Maryland who provide near-real time colour composite images on their web site http://rapidfire.sci.gsfc.nasa.gov/realtime/ -- except that I have changed the tone curve to emphasize colour differences in the lake, at the expense of brighter areas like clouds. Click on each underlined date below to view a larger copy of the image. Over the last week, Lake Winnipeg has completely frozen over. Clouds obscured most of the lake most of November – consequently I haven’t seen any images inspiring enough to post (and I have had a thesis to write – concentrating my mind elsewhere.) The 25 November image is really poor quality – captured looking way off to the side from the satellite’s path. (The best ones are, of course, on the days when the satellite passes directly overhead – like the one above on 3 December.) But you can see that ice floes covered the western half of the South Basin already by the 25th – when the North Basin was still pretty much ice-free north of Berens and Reindeer Islands (including in the cloud-covered area north of Long Point – where it was still ice-free except along shore in a glimpse through the clouds on the 27th. Today – the 3rd of December – there’s no open water visible anywhere. The smooth white ice has a fresh snow cover over it. The darker ice, with cracks and ridges, is snow-free and probably a few days younger than the white. South Basin, 15 October 25 October 2005 12:30 Over the last month there have been only a couple of images clear enough to see parts of the lake, and those were very poor quality, the satellite looking across from too far to the east or west – hence, here’s the first since the 26th of September. The Namao is just finishing up her cruise this week. Though there don’t appear to have been extensive surface blooms since early September and though they did see a lot of diatoms, Aphanizomenon flos aquae – a bluegreen – was still the dominant species in the lake. 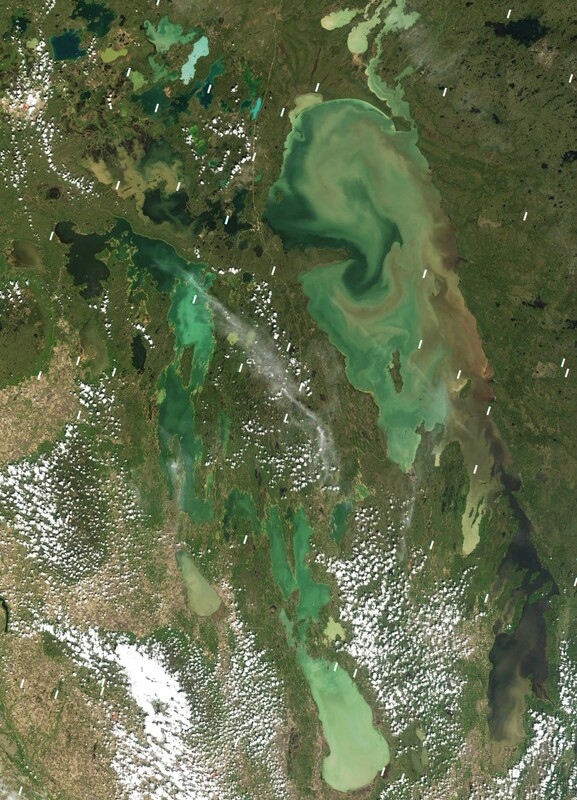 There were surface blooms in the South Basin as late as the 15th of October – note the green NNW of Elk Island in the image of the South Basin on the left. For more on the algae, check this link. It’s by Hedy Kling, who looked at this summer’s samples (not only from the Namao, but from the Province earlier this summer, and others) under her microscope. She wrote a brief report on the algal species in Lake Winnipeg this summer, and posted some beautiful microphotographs of them. 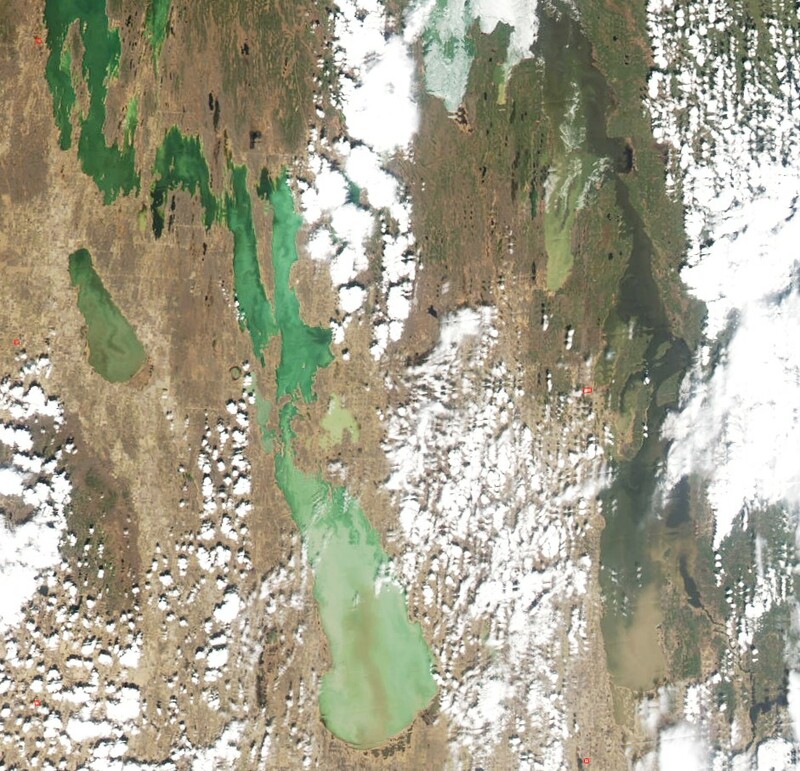 26 September 2005 13:00 There doesn’t appear to be much left of the intense algal blooms that we saw in the North Basin in late August/early September. Although the clearer water is still quite green, the patterns in the North Basin now appear to be mostly due to swirls of more turbid water. There’s been a lot of erosion along the north shore, and some along the east. If you look back through earlier images, you can see how huge gyres due to very large scale circulation can have carried plumes of more turbid water (with more particles of clay – tending to milkier colours, or light tan coloured as along the north shore) throughout the basin. 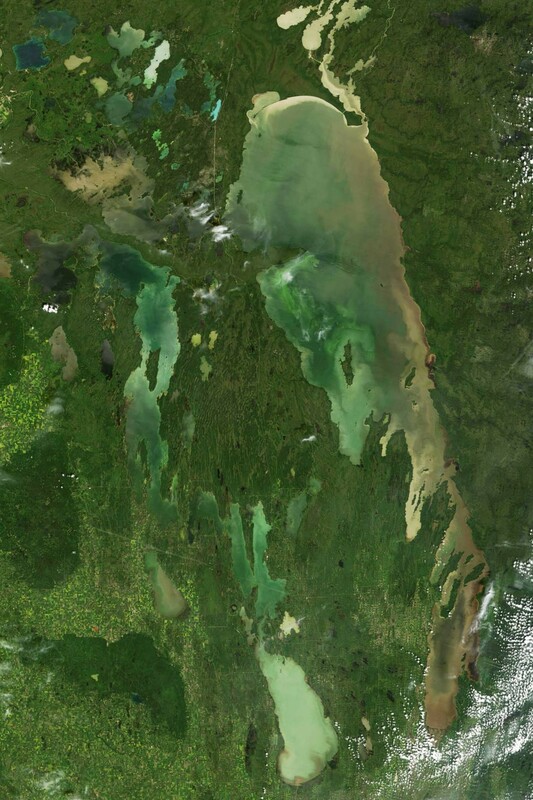 For instance, check out the light-tan coloured strand curling counter-clockwise down from the turbid water along the northeast shore in the image of 7 September 2005. 12:55 19 September & 12:40 21 September 2005 The bloom that was so intense in the South Basin on the 18th is not as sharp in this image – but the green is still visible – probably much the same amount of algae, but mixed back down into the water column and so partly hidden by the turbidity. 13:55 18 September 2005 Much of the North Basin is cloud-covered in this image, but what we can see may serve to help planning for the Namaos’s fall cruise, which is set to begin in less than a week now. 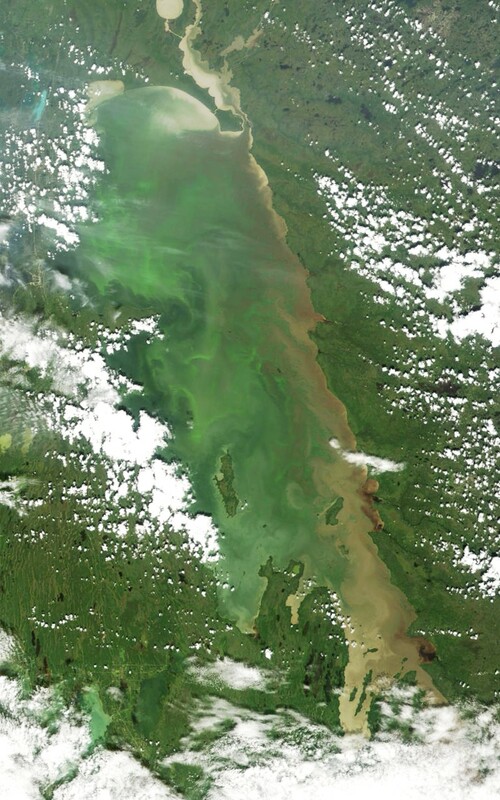 Intense surface blooms of algae have developed offshore in the South Basin, now stretching up the centre of the basin from within 10 or 15 km of the Red River all the way up past Hecla Island. As over the last couple of weeks, they are in what appears to be relatively clear water (darker brown in these images) well offshore. As always, there is a mystery – why are there no blooms in the clearest water in the South Basin? – that is, in Traverse Bay at the mouth of the Winnipeg River. Maybe the Red River water is just that much more nutrient-rich. But I wonder if maybe the answer lies in how fast water is pushed through the bay, and how fast a bloom can develop. Looking back over the last few images, you can see that the blooms in the centre of the basin have been growing over more than a month – a little stronger in each image. The water in Traverse Bay is continually being diluted with new Winnipeg River water. Perhaps as fast as algae multiply there, they are carried out of the bay, into the basin. 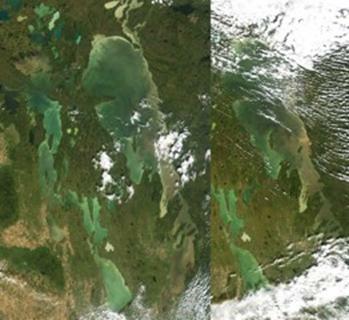 Traverse Bay may even be an incubator – lots of nutrients and light, so lots of algal production, but no accumulation until the bay opens out, the flow-through slows, et voila! a bloom where the Winnipeg and Red River water meet. But that, for now, is speculation. A few well-chosen stations on the fall cruise may tell us a lot. 13:50 11 September 2005 The very extensive surface bloom that had covered much of the North Basin since late August has dissipated. All that is clearly visible in this image is a small, less intense surface bloom north of Reindeer Island. Much of the North Basin remains quite green – there is still algae there, but now mixed down through the water column. There is still a long narrow patch of algae a few kilometers off, and parallel to the west shore in the South Basin. 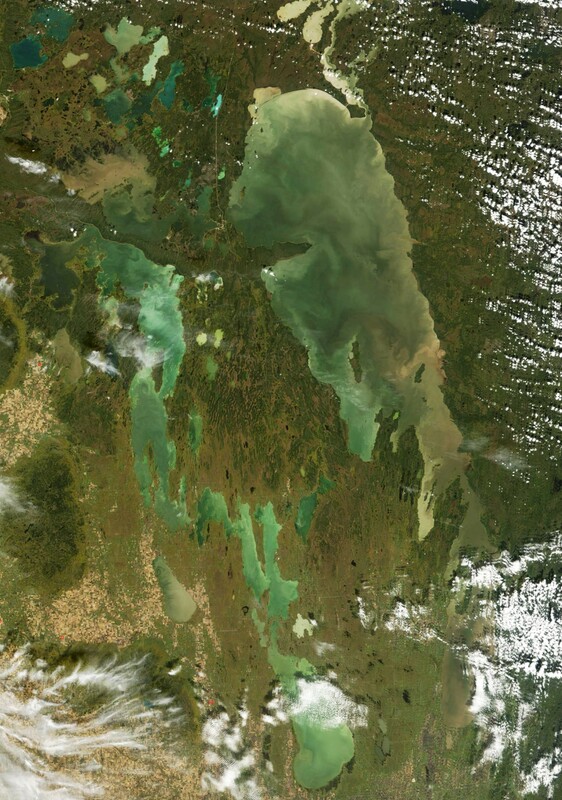 The light tan colours on the east side of the basin indicate more turbid water; the darker, slightly greenish browns on either side of the green bloom indicate that it is surrounded by somewhat clearer water than along the east side – a slightly better lit environment for algae to grow in. The surface bloom in the North Basin is very nearly as extensive as on the 29th of August, although not as intense in this image. In the South Basin on the 29th, there was a small patch of algae east of Elk Island. Today, there is a long, thin bloom few kilometers off the west shore. 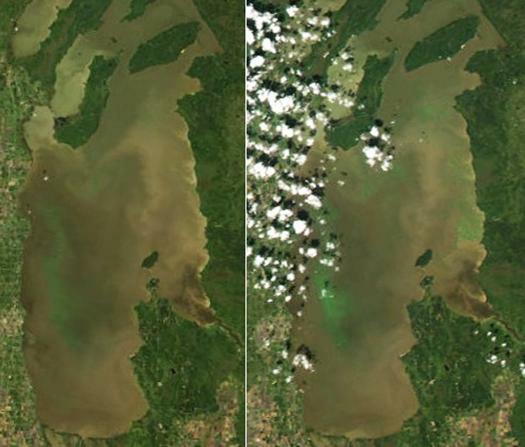 The difference between these two images of the South Basin shows how quickly surface blooms can develop. The two were recorded only one and three-quarters hours apart, and in that time a lot of algae floated themselves up to the surface over along the east shore, and up in the northern part of the basin. Even the bloom off the west shore is more intense. It was a bright sunny day, and there was only a light breeze – pretty good conditions for a surface bloom to develop if there are enough blue-greens in the water column to have an effect. And clearly, there are. 12:35 29 August 2005 A huge surface bloom of blue-green algae formed up over the last few days – you can tell by the bright yellow-green colours in great swirls all over the North Basin. Given that the area of the North Basin is roughly 17 000 km2, we must be looking at more than 10 000 square kilometers of tiny green cells. The darker green water flowing along the north shore of Long Point is Saskatchewan River water – clearer than the older lake water around it. It seems to have split into two huge plumes curling both to the north and the south around the point. It would be really useful to our understanding of these blooms to know the difference in chemistry between those two different waters – the one producing widespread surface blooms, the other greenish with algae, but perhaps not the same species since they’re not floating up to the surface. 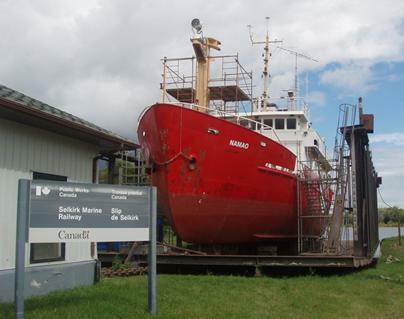 Ah, well…maybe when the Namao heads north in a few weeks – that’s her on the right, out of the water in Selkirk for her hull inspection and recertification. On a much smaller scale than in the North Basin, there are several blooms showing up through the turbidity in the Narrows and the South Basin. 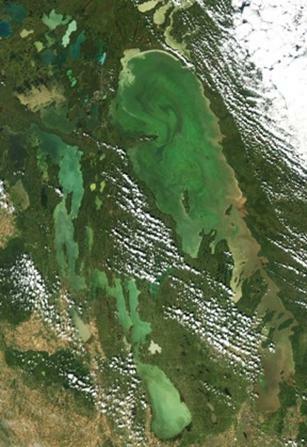 Notice the green patch just west of Elk Island and Grand Beach. That’s algae taking advantage of a patch of clearer water. 13:00 25 August 2005 The satellite caught this image of the lake between the clouds. A few hours later and the lake would have completely clouded over as a big low pressure air mass moved in from the west. 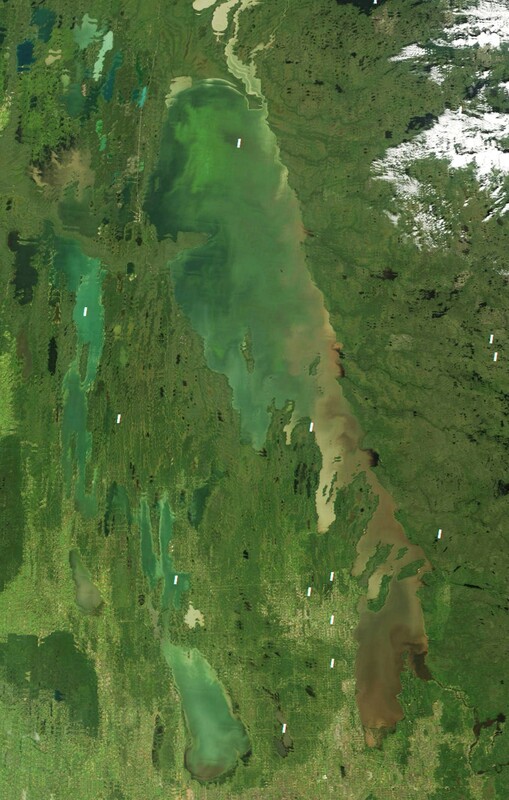 Take a look at the striking plume of turbid water (light tan colour, loaded with suspended silt and clay) flowing out and through Playgreen Lake just to the north of Lake Winnipeg. The turbid water comes from erosion of the north shore – you can see turbid water all along the shore and at Limestone Point, spreading many kilometres to the south. The erosion is particularly evident now because of the strong north winds a few days ago. Sustained winds don’t only create powerful waves striking the north shore, they also push water along with them northward, in this case raising the level along the north shore by about a third of a metre so that the waves are washing over the beaches and cutting into the high clay and peat banks behind them. (You can find lake levels on the Water Survey site at http://www.wsc.ec.gc.ca/products/main_e.cfm?cname=products_e.cfm ). Most of the Nelson River water flows out the Two-Mile Channel – an artificial channel constructed by Manitoba Hydro to improve the hydraulic efficiency of flow out and downstream. You can easily see the Two-Mile Channel in this image – a straight-line channel out of the lake near the north-east corner. The natural channel at Warrens Landing – a broad, shallow outlet, often thick with pond-weed by August – is hidden by clouds. I don’t know why, but many of the pictures below do not show up on this home page. Please bear with me. I’ll figure this out and fix it when I have a little more free time. For now, please just click the links below (underlined); you will still be able to view the larger images. http://www.noetix.ca/WaterQuality/ . Their map is based on an AVHRR image – a different satellite. It passed over the lake later in the afternoon than the MODIS image on my site. If you compare the two, you’ll see that the surface bloom had spread further to the east by the time of the late afternoon image. Its just a matter of a little more time on a calm afternoon for more algae to float themselves up to the surface. There have been few cloud-free days lately – these are the best images in the last three weeks. 12:10 1 August 2005 There’s still a lot of algae in the North Basin, though the blooms are not as intense as in early July images. There’s a surface bloom up north of Long Point, but south of the point, the algae appear to be more deeply mixed into the water column – perhaps by rough weather. I think that the most striking thing in this image is the dark water at the mouths of the Bloodvein, Pigeon and Berens Rivers. Like the rivers draining the prairies, the rivers coming off the Shield are still running high. For those of you who don’t live beside the lake, the graphs below might help you put the current lake levels in a longer term context. The upper graph shows daily mean levels on Lake Winnipeg since 1913. The highest levels on record were in late July, 1974 – a little over 219 m above mean sea level. The lower graph shows recent data recorded at the Water Survey station at Gimli. These are also mean daily values; with a strong north wind the levels in the South Basin could easily be pushed considerably higher. The peak so far, on the 24th of July, was just under 219 m – about 0.4 m short of the highest mean daily level recorded. You can view graphs of recent data for lakes across Canada at the Environment Canada at http://scitech.pyr.ec.gc.ca/waterweb/formnav.asp?lang=0. The blooms south of Long Point that had already developed by the 12th of July are still there in this image from the 21st, though they don’t appear as intense. And where it was just greening up to the north of Long Point, there is a full-blown bloom in this image – the green is softened a little in this image by the band of cirrus clouds running west-east over just north of Long Point. There was a surface bloom in Washow Bay (north of Grindstone Point) on the 12th; you can’t see it in the image above recorded on the 24th. It’s a shallow bay, and perhaps over the last few windy days, bottom sediments have been stirred up into the water column – that would explain the light tan colour you see in Washow and other western bays in this image. 12:35 12 July 2005 The incidence of surface algal blooms has spread compared to the image of a few days ago (8th of July). They’re still there south of Long Point, but now there are widespread blooms between Georges and Reindeer Island, and just to the north of Berens Island. I got this from Bill Franzin today (the 12th) – “We flew from Georrge Island to Matheson today and there were extensive sickly green blooms intermittently all the way.” On the 8th, there was a small bloom visible in Washow Bay (just north-west of Hecla Island); today you can see it more clearly than before, and it extends up through the Narrows past Pine Dock. 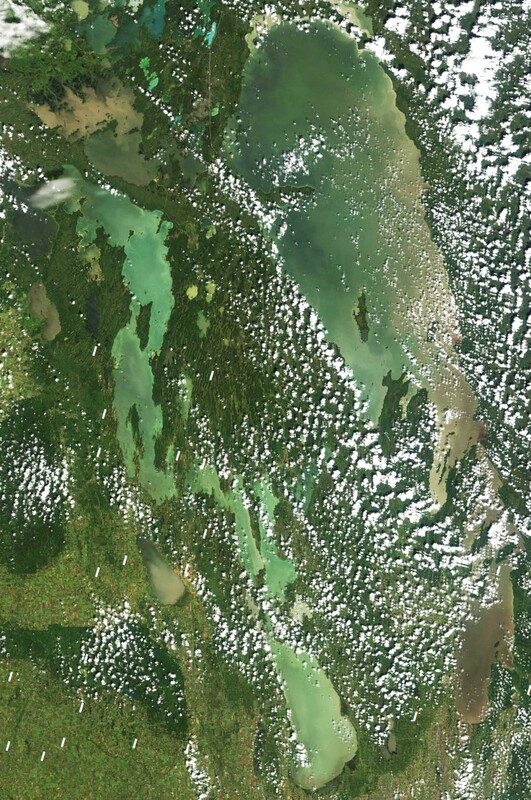 The turbid plumes of both the Red River in Lake Winnipeg (flowing up the west shore as on the 8th) and the Portage Diversion (of the Assiniboine River) are clearly visible in this image. 13:00 8 July 2005 The first big surface blooms of algae have already appeared in the North Basin, just south of Long Point. That’s a couple of weeks earlier than last year. They appear to be starting in the same regions of the lake, though – compare this image from the 26th of July last year – that is, from around Reindeer Island up to Long Point, and perhaps also off the west shore north of Long Point. 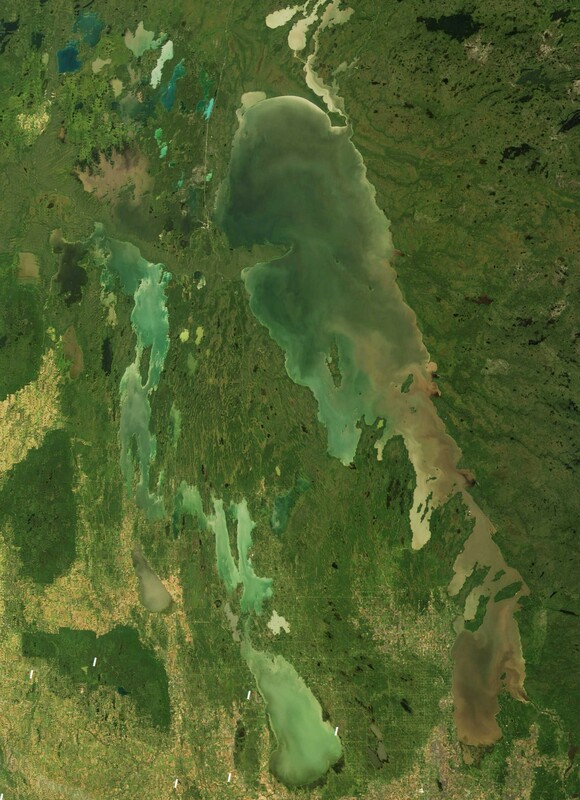 But the brown colour at the south end of the lake indicates that there’s still lots of silt and clay coming in from the Red River, and that should inhibit the growth of algae in the South Basin, though blooms could still develop in the clearer water – darker and greenish off the west shore from Gimli to Hecla Island, for instance – where there is more light available for growth. It’s interesting how the turbidity spreading from near the mouth of the Red River appears to flow up the east shore past Elk Island, where it meets the darker plume of Winnipeg River water. (It followed the eastern shore on the 30th of May, too. This is the path that one would expect if the Coriolis force deflected flow passing through the basin – it turns flow to the right in the Northern Hemisphere. The plume of clear Saskatchewan River water, in the image of the 15th of June, probably turns right and hugs the shore of Long Point for the same reason.) 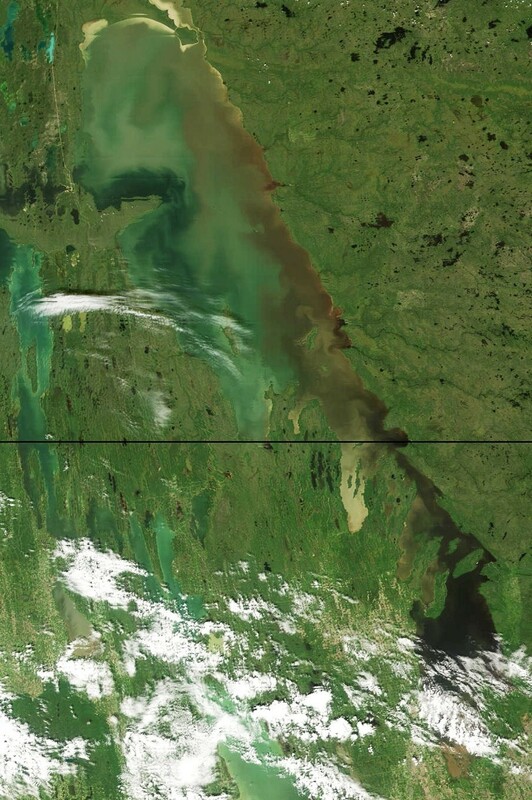 The yellow-brown, silt-laden Red River water mixes only incompletely with the darker Winnipeg River water, so that their passage northward is marked by two distinct bands of colour in this image. This is the first reasonably clear day over Lake Winnipeg in the last couple of weeks. As you can see, the South Basin is much more generally turbid than in the last previous clear image on the 15th of June. This won’t be news to Manitobans, but for the rest of you, the three major rivers tributary to the lake – the Red, the Winnipeg and the Saskatchewan – are all running at or near record high flows for this time of year. Not as high as record spring floods, but in the case of the Red, still very high – at 2200 cu m/s almost double the previous July record flow of 1200 cu m/s, and more than half the1997 flood peak of 4250 cu m/s. 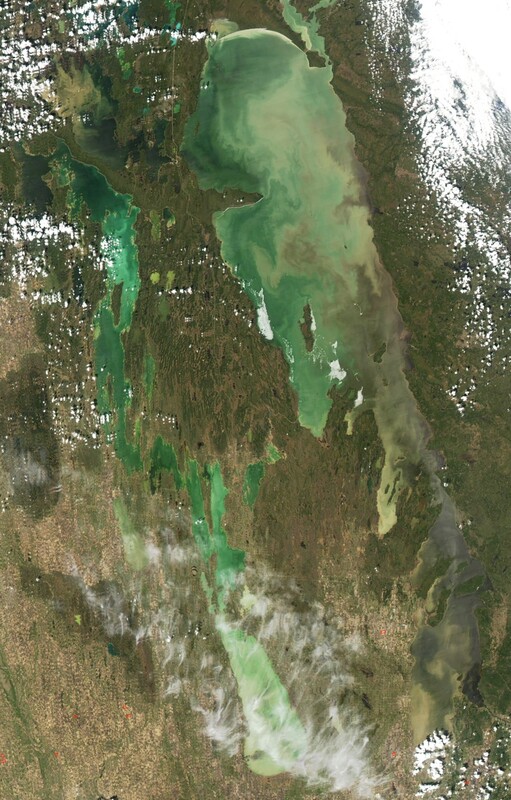 Since the loading of nutrients into Lake Winnipeg is very much a function of inflow, this year may see more nutrients carried from the watershed into the lake than any year since 1997. We can expect consequences in the form of continuing intense algal blooms for several years to come. 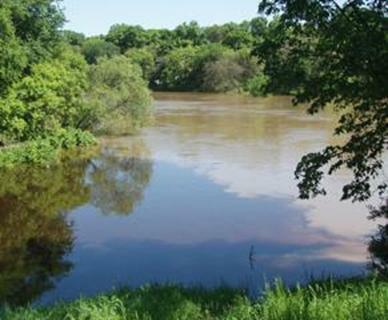 http://www.gov.mb.ca/waterstewardship/water_info/index.html. And for historic perspective, they have a link to Environment Canada’s water data site with its complete data archive. 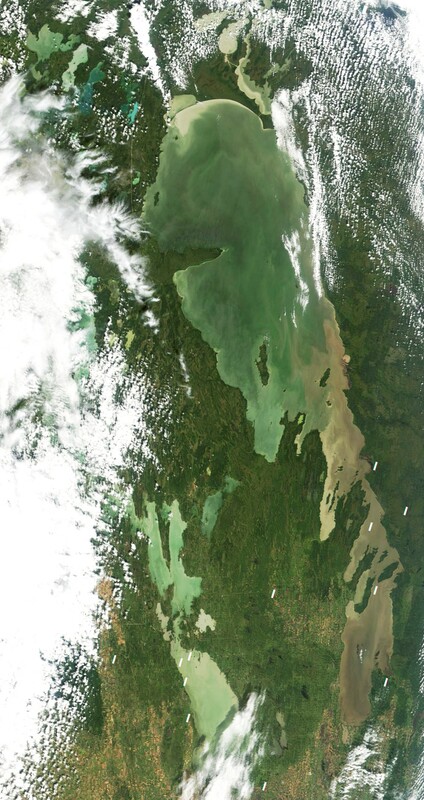 The plumes in the North Basin of Lake Winnipeg are less distinctly drawn by the 15th compared to the 30th of May but the distribution of clear, turbid and brown waters that was set up more than two weeks ago is still evident today. No one who lives along the Red or Assiniboine Rivers, which are both flowing at near flood stage, should be surprised at the turbid brown patch at the south end of the lake. That’s silt-laden river water spreading out into the South Basin. The picture on the left is of a muddy Assiniboine River water flowing past the smaller Omand’s Creek – taken this afternoon – the 15th of May. 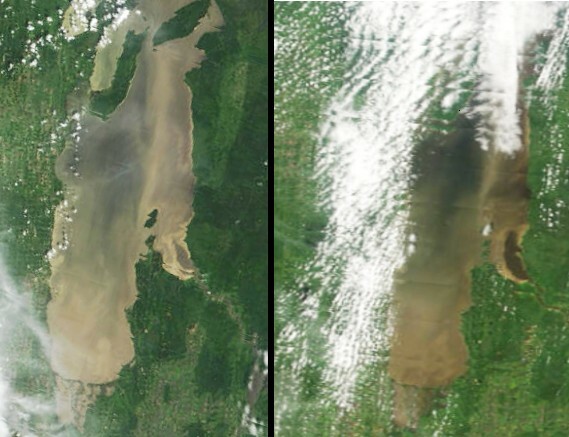 The colours are something like what you see in these images of Lake Winnipeg – brown silt-laden water on upper right – the Assiniboine River – and darker water rich in dissolved organic material on the lower left – Omand’s Creek. The Portage Diversion was opened on the 13th, diverting part of the Assiniboine River into the south end of Lake Manitoba. You can see a small plume of turbid water in the south end of that lake as well, although much less impressive than on Lake Winnipeg. Discharge from the Red River into Lake Winnipeg today will have been at least 10X that flowing into the south end of Lake Manitoba, 800-900 cu.m./s in the Red compared to 80 through the Portage Diversion. 12:55 30 May 2005 This image is remarkable for the strong colour contrasts in the water circulating in great plumes in the North Basin. Turbid Red River water is spreading up along the eastern shore of the South Basin. There will be a lot more of that in coming weeks as the Assiniboine and Red swell from last week’s rains. Along the east shore of the North Basin, the rich red brown signifies a large contribution from rivers draining extensive wetlands on the Shield—they must be flowing high as well – and carrying a high concentration of dissolved organic material – water the colour of dark tea. In the north, the flow of Saskatchewan River water through the lake is especially interesting. Darker (clearer) water flows from the river mouth (about 10 km north of the north shore of Long Point) first south-easterly and then easterly along the shore until it is turned to form a great clockwise (anti-cyclonic) gyre south of the tip of Long Point. You can even see how it gradually entrains more turbid water from beside or below the path of its flow, becoming gradually lighter in tone, beginning from the darkest water in the eastern basin of the Grand Rapids reservoir. The yellow-brown tones in the western reservoir signify the heavy load of silt picked up in the shallows that were the sub-aerial delta of the Saskatchewan before the water was raised the behind the dam 40 years ago. The water over the old delta is very shallow, the vegetation is long gone, and river flow or the slightest winds bring old delta sediments up into suspension from the bottom. 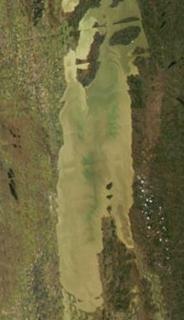 But they must be of relatively coarse silt, and not of finer clays, because they are not carried far into the reservoir (mostly in a plume along the south shore, and only a dozen km or so) before they settle out again, leaving the eastern end of the reservoir clearer than the Lake Winnipeg water into which it drains. The Grand Rapids reservoir, then, is a huge filter removing suspended sediments from the river before it flows into the lake. The small white rectangles scattered through the image signify missing data, and are becoming more common on images recorded by the older of the two MODIS instruments in orbit. The images on these pages were recorded by MODIS instruments onboard one or the other of two NASA satellites, Terra (launched in 2000) and Aqua (launched in 2003). Terra is approaching the end of its design lifespan, but many such instruments have gone on recording data for several years longer than initially planned. Aqua is expected to send data until at least 2008, by which time other satellites are expected to have replaced the functions of both of these satellites. 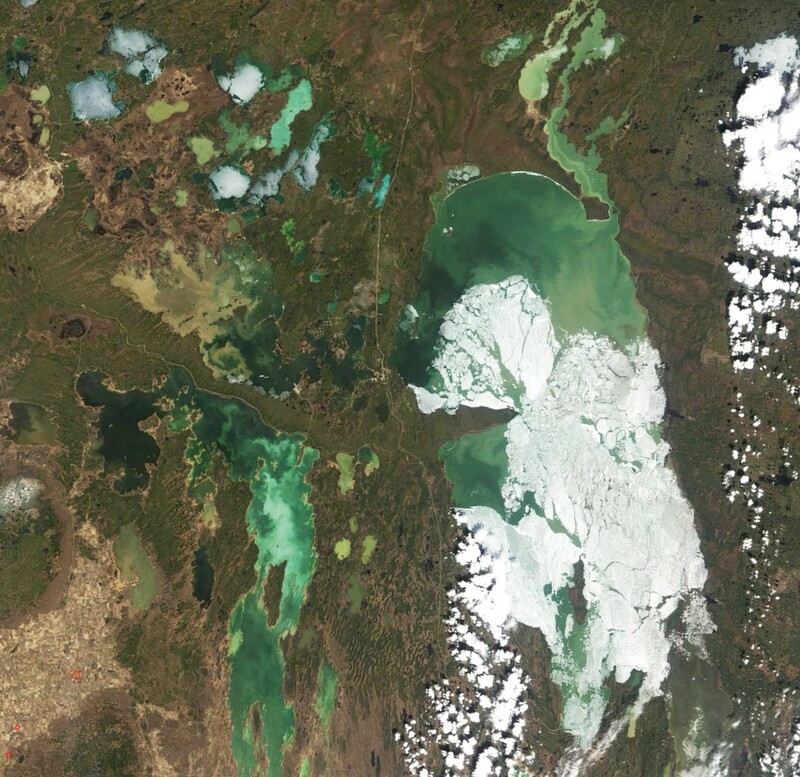 On 11th May (left) the last ice large ice floes on the North Basin had been pushed down onto the south and west shores – a couple of thousand square kilometres of ice gone in the 6 days since the 5th of May. By the 20th only smaller remnants were left. The great range of colour really enhances circulation patterns at this time of year – and this series of images gives some sense of how persistent these patterns are. Just to the north of the Narrows you can see the most turbid, silt-laden waters from the shallow west-side bays being stirred into the flow of darker, clearer water from the Narrows region and the northern part of the South Basin. Dark, organic-rich water flowing in along the east side, especially from the Berens and Poplar Rivers, is spreading north along the shores and in long curling plumes out into the North Basin. The dark water in the centre – north of Reindeer Island – must have flowed northwest from the Berens Region under the ice that covered that region only a week ago. On the 16th, there even appears to be a jet of grey-brown water spreading from that plume – the patch of grey-brown water spreading southwest into greener water and ending in a hammer-head where it is turned both north and south, 15 or 20 km northwest of Reindeer Island. By the 20th, the head had spread several km further north. All of this dynamic stirring of turbid and clearer water, more and less nutrient rich waters, perhaps even more and less acidic waters (the brown waters flowing off the Shield are more acidic, the western waters are buffered by carbonates from the bedrock that underlies the Plains) must surely contribute to the patterns that we will see in the algae that develop this coming summer. Note the bright tan water along the north shore – evidence of erosion of the high permafrost-clay banks there. According to the record at Berens River, winds blew southerly at 10-20 km/h for several hours before the image was recorded. And down at the south end, the Red River water flowing into the lake today appears to be clearer – to have less suspended material in suspension – than the South Basin water it is flowing into. 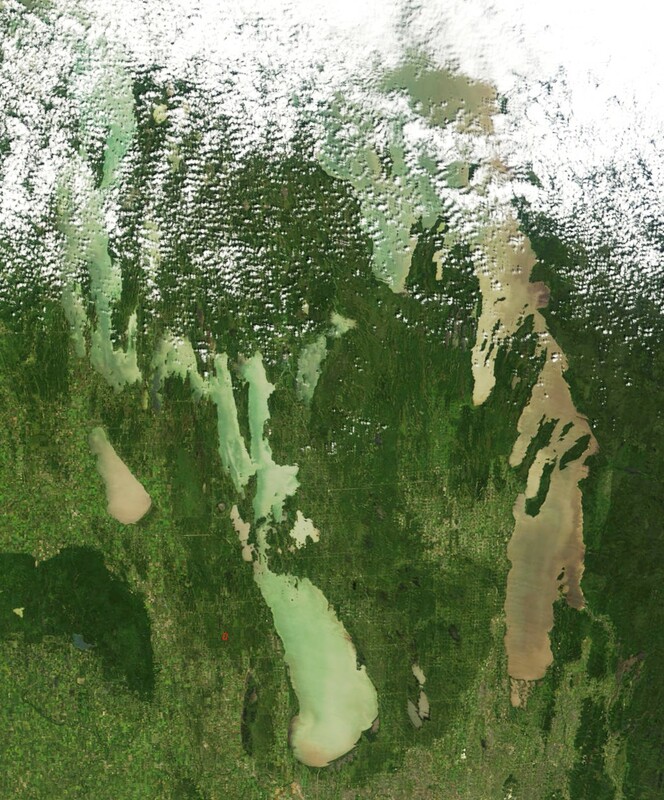 On Lake Manitoba you can still see a remnant of the silt-laden Assiniboine Diversion water that spread into the lake a few weeks ago (2 May 2005) – a thin yellow-brown diagonal streak running down the centre of the southern basin. Frances Russell asked me if I had any thoughts on why was break-up on the South Basin was so early this year, given the miserably cold late April? That made me look back at my own data more closely. The break-up on the South Basin by 22 April this year was not quite the earliest ever. Records kept by the Environment Canada weather observer at Gimli indicate that from 1946-91 the earliest date that the South Basin was fully ice-free was 28 April. I’m not sure about more recent observational records by people on the lake, but from inspection of satellite images, the South Basin was almost half clear of ice on 15 April 1998, and there was no ice visible in the next cloud-free image on 23 April -- so that it was most probably free of ice a few days earlier than this year. It was close in 2000 as well, 77% ice-free on 22 April and fully clear in the next cloud-free image, on the 26th. As to why break-up would have been so early this year: The graph to the left shows the relationship between the April mean air temperature recorded at Gimli and the "half-clear" dates for the South Basin. (“Half-clear” – the date when roughly half the ice surface has melted – is easier to pick from satellite images than the last day of ice out. The last day is as easily as not sometime in a string of cloudy days.) April mean temperature is a good predictor of the half-clear date except for five odd years: 1996 – later than the general trend; 1995, 1998, 2000 and 2005 – earlier. Statistically, vernal warming predicts 62% of the timing of break-up, and something else accounts for wide swings from that trend. The April warming pattern itself may be part of it. This year, early April was relatively warm, late April unusually cold – so that the melt got an early start, even though the warming seems to have stalled. Snow-covered ice reflects roughly 90% of solar radiation, water absorbs 90%. Even a little bit of open water would have multiplied the effect of what little warming sunlight we had in late April. Plus, this spring there were strong winds that certainly pushed the ice about, physically breaking up the floes. That quickly added to the fraction of open water -- you can see that in the series of South Basin satellite images. Then too, the time it takes to melt the ice cover is a function of how thick it is at the beginning of the melt period. During a relatively warm winter it won't grow as thick as during a colder winter. 1998 and 2000 – two outliers on the attached graph – were two of the warmest since 1987. But certainly a warm winter is not this year's explanation! However, if the ice had a thick insulating blanket of snow all through the winter, that might accomplish the same. Last December we had unusually high snowfall. More insulation, less heat loss from the ice and water below, hence a thinner ice sheet at the beginning of April. So a thinner ice cover (possibly – I have no measurements) due to an insulating snow cover, a little water opened up by a bit of early April melt and then wind to dramatically enlarge that open area so that what warmth the sun did give could be absorbed into the water column – lots of possible reasons for an early break-up in spite of a miserably cold late April. 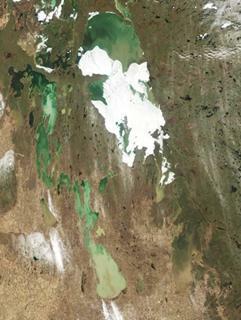 The ice pack in the North Basin is much more fragmented than in the image recorded 3 days ago. Although at a glance it appears to cover much the same area on the 2nd and the 5th, there is a lot more open water today around the mouth of the Saskatchewan River, while on the east side the pack has been driven up against the shore, reducing the broad open area there on the 2nd to a few smaller open patches today. It was mentioned at one of the Lake Winnipeg Stewardship Board’s Public Meetings yesterday how early the ice was off the lake this year. It made me think that people might like to see this graph. I used measurements on satellite images to make this time series graph of the dates when the each basin was about half-clear of ice in the springs since 1986. You can see how closely the North Basin break-up period follows the April average temperature -- the green line (i.e. the April average temperature measured at Berens River, about halfway up the lake. Notice that the temperature scale is intentionally inverted, to make it easier to see how the warmer Aprils fit with the earlier break-up dates.) Looking back at the series of satellite images below, the equivalent “half-clear” date on the South Basin this year was about 22 April – easily a couple of weeks earlier than the average over the last two decades. 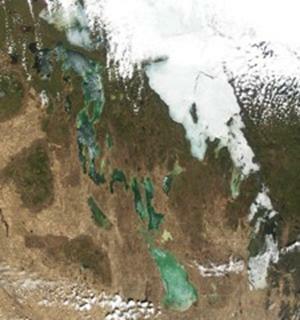 This year, the date when the South Basin was 100% clear was very soon after that “half-clear” date – and, as Bill Barlow of the Lake Winnipeg Stewardship Board said, the earliest completely ice-free date on record. 12:30 2 May 2005 In spite of the colder weather this last week, much of ice cover has been cleared from the North Basin. 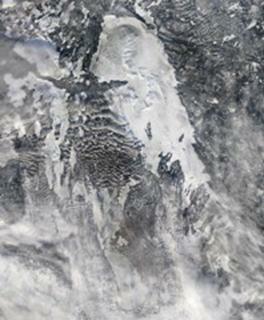 Some interesting features on this image: Grand and Hillside Beaches in South Basin are bright white. Is that snow left from yesterday, or remnants of ice pushed up onto the beaches during the frequent northerly blows over the last couple of weeks? You can see the same thing on several north-facing shores at the south end of the North Basin. 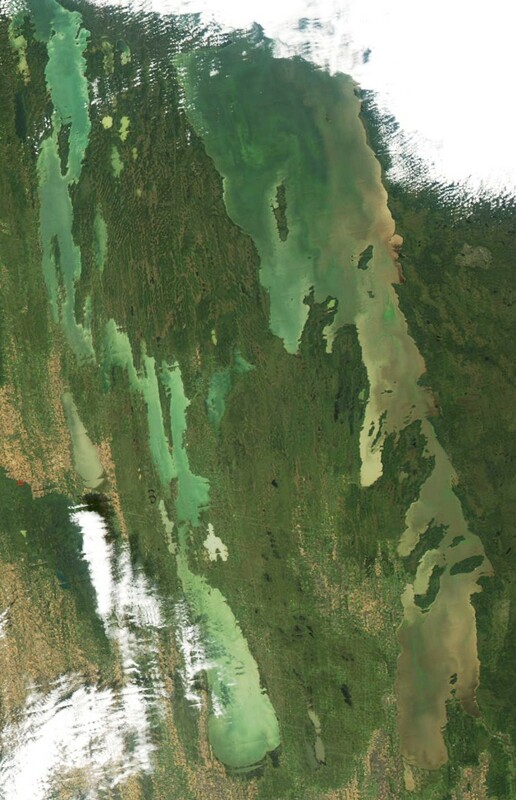 Muddy brown Red River water has spread through much of the southwestern South Basin, and the clearer (darker) Winnipeg River water has created a plume through much more turbid water in Traverse Bay. 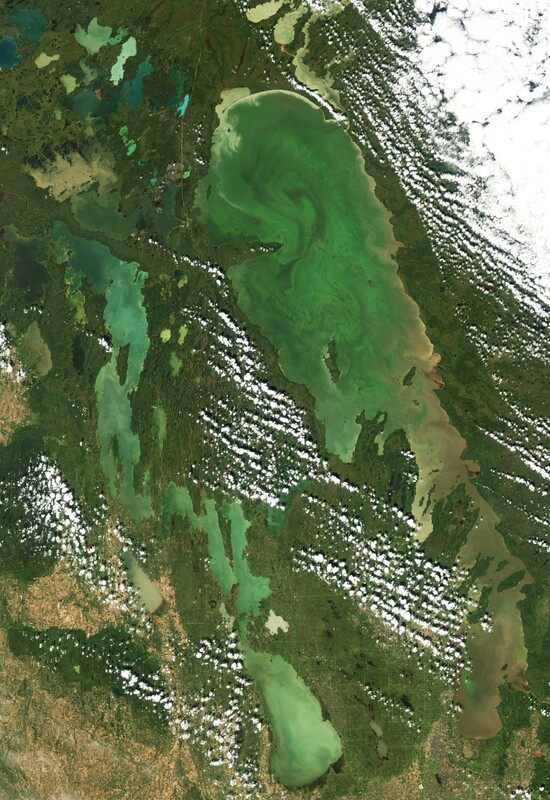 The turbid plume of Assiniboine River water has spread northward far into Lake Manitoba from its source at the mouth of the Portage Diversion. A couple of other things: there is a beautiful anti-clockwise (cyclonic) gyre of turbid water where the Saskatchewan River water is flowing into Cedar Lake. 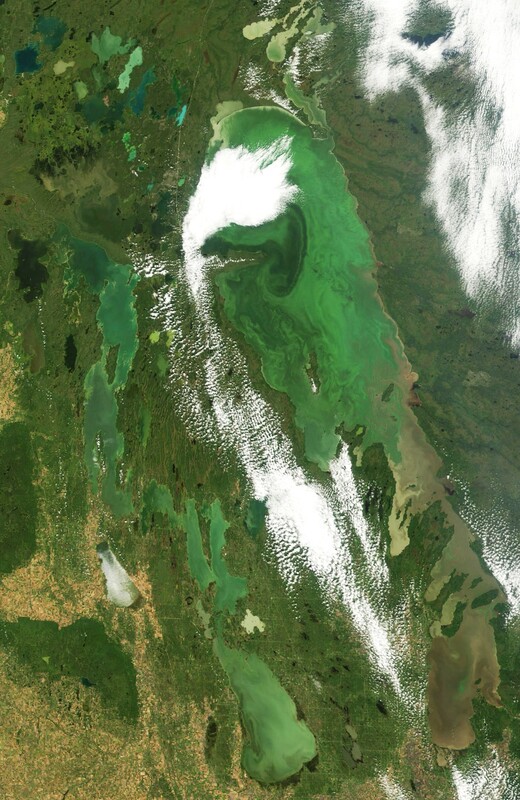 And what are probably whitings – areas of calcite precipitation – has created a huge milky plume in Lake Winnipegosis. And snow patterns in the south and west are interesting. It snowed yesterday and the day before, and is melting today. You can see it hanging on longer in forested parks (compared to the open fields around them) west of the lakes. 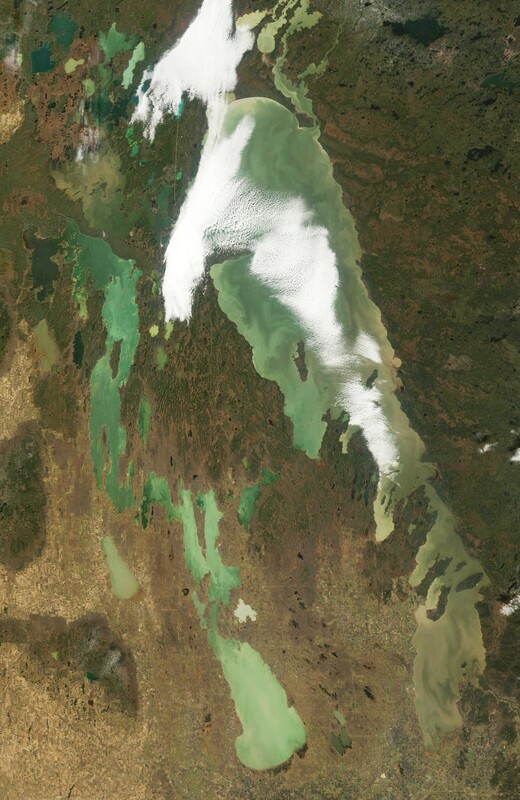 And south of Dauphin Lake and Lake Manitoba – long bands of snow on the ground that must have been generated by lake-effect precipitation – that is, precipitation from air masses that picked up moisture blowing across the relatively warm lake surface. If you want to know more, check out http://www.x98ruhf.net/lake_effect.htm for a description of the process as it applies to the east shores of Lake Michigan. 12:35 23 April 2005 Most of the remaining ice was cleared from the South Basin over the last two days. Although it hasn’t been particularly warm, it has been windy – all of the remaining ice in the basin is pushed up against southern shores – note especially the packs lying along the shores of Hecla and Black Islands, and Grindstone Point. The winds have opened more and broader leads in the North Basin as well, and dark water from the Bloodvein and Berens Rivers has contributed to melt in the bays at the mouth of each river. 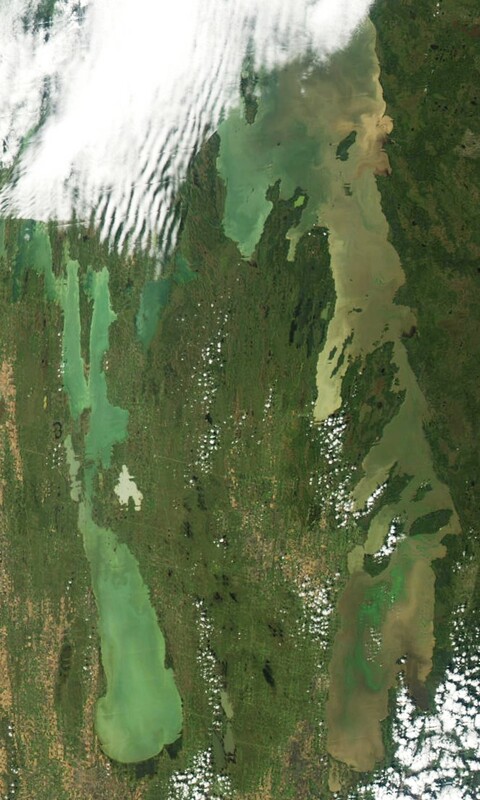 Take a look, too, at the muddy plume of water visible in Lake Manitoba now that the ice has cleared. That’s water from the Assiniboine via the Portage Diversion, which is still flowing strong. I wrote a couple of days ago that cooler weather might slow down the break-up and melt process, but that hasn’t happened – certainly not on Lakes Winnipegosis and Manitoba. The ice pack is everywhere rotten on both lakes and won’t last long now. 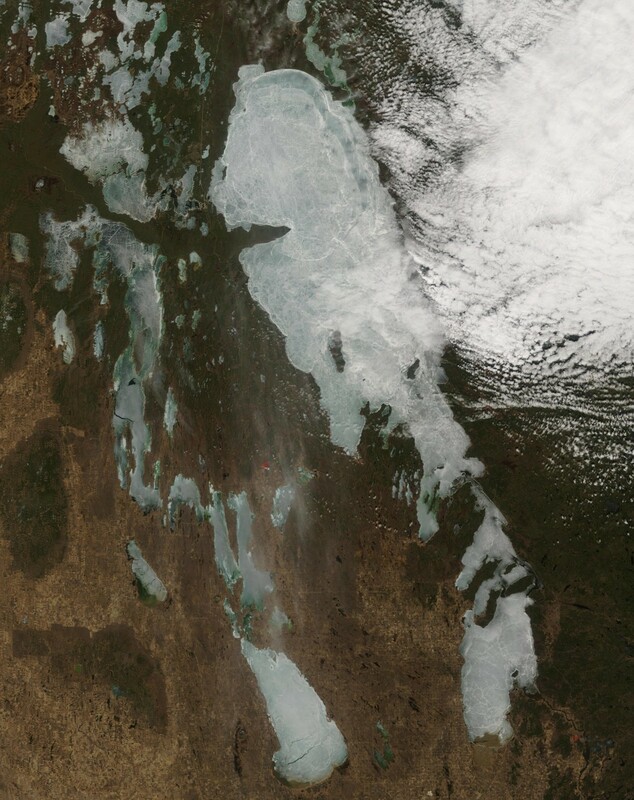 And on the South Basin of Lake Winnipeg, the ice that was pushed south on the 18th and 19th has already begun to melt away (see also the strip of South Basin images below, images from the 16th through to the 21st). The heat carried into the lake by the Red River, still flowing strong, must be having a significant effect on melt around its mouth. The remaining pack is full of broad leads that will warm quickly in this sunny weather (they reflect less, hence absorb more sunlight) and hasten the melting of the remaining cover on the South Basin There is a lot more open water today in the bays along the west side of the Narrows as well, and even in Sturgeon Bay south of Reindeer Island leads have formed, likely due to the great force of the same northerly winds that shifted the ice in the South Basin. The north end of the South Basin was opened up (compare the two images from the 18th and 19th) by the strong northerly winds – 30+ km/h gusting to over 50 – that blew through the afternoon of the 18th and on through the night. Ice was pushed south – note how much smaller is the open region around the mouth of the Red River on the 19th compared to the day before. In fact, it looks as if the pack was actually pushed over the beaches east of Matlock – that is, in the southwest corner, over the spit separating the south end of the lake from the Netley Marshes. 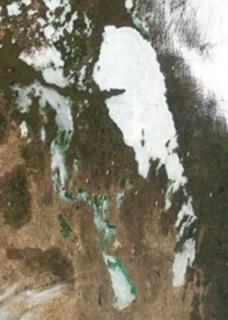 Ice melted off much of Fisher Bay – a shallow bay along the west side of the Narrows. Also over a large area around the outlet near Warrens Landing. The strong winds must have shifted ice in the North Basin, too. There was an open lead on the 19th, stretching in a long arc from the north end of Reindeer Island up to George’s Island, that wasn’t visible three days before, on the 16th of April – presumably also a result of the strong winds through yesterday and last night. 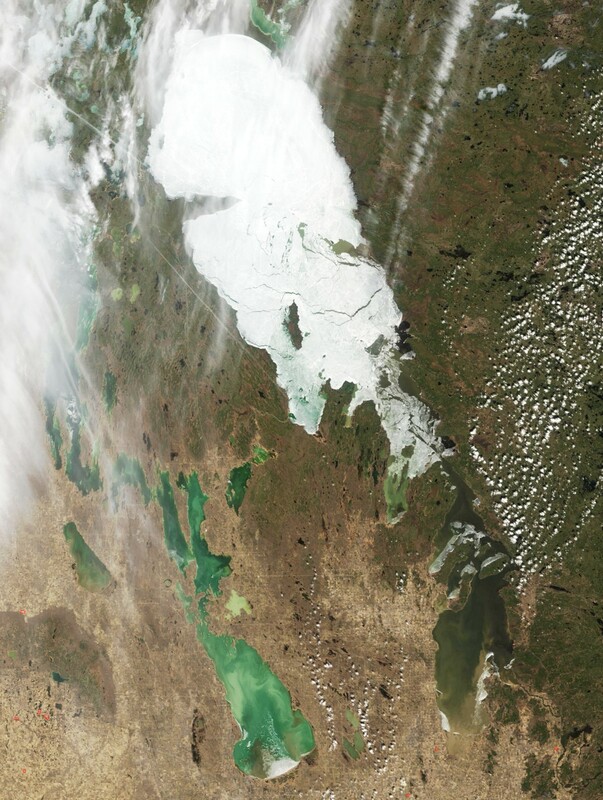 Lake Manitoba and even parts of Lake Winnipegosis are quickly being cleared of ice as well – though cooler weather forecasted may slow that down. The light brown, silt-laden water of the Red River can be seen spreading into the South Basin on the 16th. There is open water, too, in Traverse Bay at the mouth of the Winnipeg River, but it appears very dark in this image. The Red River water is the colour of the light reflected from the silt and clay in its water; the Winnipeg River is much clearer, and absorbs most of the light that falls on it; hence, it appears dark in this image. Note, too, that there is open water in the channels between Hecla and Black Islands and between Black & Deer Islands and the east shore. The ice cover cleared first from these channels because water ebbing back and forth through the channels was just warm enough to erode it from below. Click here to see an image of the whole lake on the 16th of April. Though I am studying the geography of plankton on Lake Winnipeg, it’s not supposed to be my only focus just now. Should you be interested, you can link here to a site describing my PhD research on sedimentation by the Linthipe River in Lake Malawi.